Exactly a year ago, I started this blog. This is actually my second one. I decided to delete my first blog because I was very busy with school then and I wasn't really able to update it. 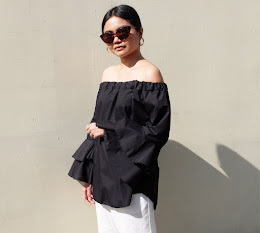 I started blogging again because I missed connecting with people through clothes, shoes and accessories. Thank you for all of your lovely comments. I honestly enjoy reading them. I also enjoy visiting all of your blogs. Thank you for inspiring me everyday with your looks. Blue tunic from Singapore, Horn necklace from the Ayala Bazaar, Forever21 gold bangles, Fringe boots- bought online. Love the color of your dress btw. happy birthday to your blog! more power! yeeeeeey! cool outfit! loving your fringe boots!